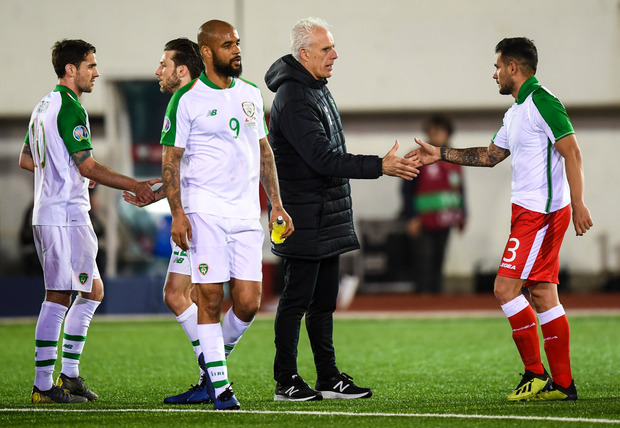 FOR a worrying time, Ireland appeared so utterly destitute that Mick McCarthy might have been tempted to approach the Bank of John Delaney for an interest-free loan. Perhaps the famously benevolent FAI boss could offer €100,000 worth of creativity, a six figure advance of inspiration. Or a few quid to entice Declan Rice into another change of mind. Another of those Darkest Hour evenings that, these days, are the house speciality at the Green Grill was looming until Jeff Hendrick added some urgently required nutrients to the menu. Ireland won, but this was hardly the emphatic, upbeat State of the Union address with which McCarthy would have hoped to launch his second term as Commander-in-Chief. The polar opposite. Only a stunning moment of fast-twitch agility from Darren Randolph denied Gibraltar, 194th in the world rankings, loser of all 20 of their previous qualification games, from taking a stop-all-the clocks 46th minute lead. At that low point of the evening, McCarthy looked like a man who would happily swap jobs with Theresa May. There was absolutely no backstop had Ireland failed to find the kill-shot to put away one of the weakest teams on the planet. Had the airport adjacent to the Victoria Stadium been offering flights to Saipan at half-time, the haunted-looking coach might have been tempted to purchase a one-way ticket. Then, with the most seismic shock of Gibraltar beckoning, came the Hendrick and tonic. Ireland’s first goal in 450 minutes of football staved off mortification, ensured there was no catastrophic reprise of the tasteless dregs of the Martin O’Neill/Roy Keane era. But it hardly cleansed the decay from the rusting hulk of Irish football. Even the three points could not mask another dreary, downcast, depressing international evening. It hardly requires a jackhammer to bore down for evidence of the startling downturn in Irish fortunes over the last 18 months of hapless O’Neill-led freefall. One statistic might persuade some to seek heavy medication: Gibraltar, a nation that conceded 103 goals in their last two qualification campaigns, won three times more games than Ireland in 2018. If Delaney had offered fans an interest-free E100,000 loan after a scoreless, dismal, four-game autumn did for O’Neill, how much would have been invested in season ticket renewals? McCarthy’s immediate assignment, then, was to attach jump leads to the stalled O’Neill motor, offer an upbeat diversion from the endless flurry of negative headlines generated by plummeting performances, Declan Rice’s defection and Delaney’s outlandish loan to the FAI. After the groping, aimless 18-months, to offer an uplifting 2020 vision: To offer hope that Ireland will not be the first nation to fail to qualify for a tournament they are co-hosting. But, in truth, this was more a sleepwalk than reawakening. If Rice was watching, he would hardly have believed he had erred in switching to the land of his birth. Storm-force gusts demanded intricate play, patience and structure; bizarrely, from the kick-off Ireland chose instead to launch a hopeful, low-percentage, aerial bombardment. Conor Hourihane had a reasonable game, but it was a rare nugget on an impoverished evening. The high-profile, right-sided alliance of Seamus Coleman and Matt Doherty failed to fire. What a unique, stunning setting in which McCarthy’s second-coming was launched. The Rock of Gibraltar loomed, like a giant, limestone Tony Cascarino over one end of the pitch. Then there was the headland’s airport runway, running so close to the pitch that a mishit pass might have taken out the EasyJet flight which took off five minutes into the game. Throw in a plastic pitch and the hugely disruptive gale howling across the bay and it is possible to offer some mitigation for yet one more sub-par Irish display. But not to fully excuse the poverty of a performance against part-time opposition drawn from a country with only one pitch and a population half the size of Monaghan. There was precious little in the way of creativity or artistic merit; the hoped for champagne bubbles that would signify a new beginning fell utterly flat. Even as I write, masochists all over the globe are online rejoicing in the grim lowlight packages. The opening 45 minutes, a couple of Hourihane deliveries from the left aside, was a dull monotone, low-quality, a study in tedium. Seconds after the restart, with Darren Randolph compelled to make a stunning point-blank save from Roy Chipolina, it felt like the walls were closing in. Hendrick’s goal was an isolated moment of quality: A calm side-footed finish after lovely approach work by Hourihane and David McGoldrick. But, otherwise, it was relentlessly lowgrade, hardly the performance to lift the dark cloud which descended over the final faltering 12 months of the O’Neill era. McCarthy has a winning start and Georgia come to Dublin on Tuesday. But the shiver that the manager will have felt last night was a sign that Siberian permafrost has yet to clear. And that it might require more than €100,000 to bring about the Big Thaw.